Welcome to Late Model Digest! – Here's a sneak peek at what's in the latest issue of LMD, and what's going on in pavement Late Model racing. The first LMD issue of 2019 will be finished two weeks from now. In the meantime, check out a few extra photos from the 51st annual Snowball Derby December 2 at Five Flags Speedway in Pensacola FL. Thanks to our contributors Buddy Bryan, Kim Kemperman and David Kranak. It’s November, and that means there are two issues of Late Model Digest left in the season (after the one we have just released). That also means there will be plenty of track and touring series champions who will be profiled in those last two issues, set to be finished November 15 and December 7. We realize that our coverage is often geared toward touring action, but this is our chance to tilt the scales the other way. A couple of those track champions are featured in the latest issue, because their stories went along with coverage of the Fall Finale at New London-Waterford Speedbowl and the Senator’s Cup Fall Classic at the Bullring at Las Vegas Motor Speedway. Look for at least a dozen more in the next issue, and one will be about the youngest-ever Late Model champion at a facility in Florida. We’re always welcome to story suggestions, whether they’re about champions or those a bit deeper in the field or outside the box; contact us through this website or our Facebook page. Right behind the Snowball Derby on the list of the most prestigious and historic Super Late Model races each fall are the Winchester 400 at the half-mile in eastern Indiana (see Page 8) and the All-American 400 at Fairgrounds Speedway in Nashville, Tenn. (set for Nov. 3-4). And those are the only two 400-lap events scheduled for Late Models in 2018. It’s hard to believe that 21 years ago there were a pair of 400s on the same day. On Oct. 19, 1997, the 17th edition of the All-American extravaganza was held at the Fairgrounds track, then called Nashville Speedway USA; it wrapped up that year’s NASCAR Slim Jim All Pro Series. 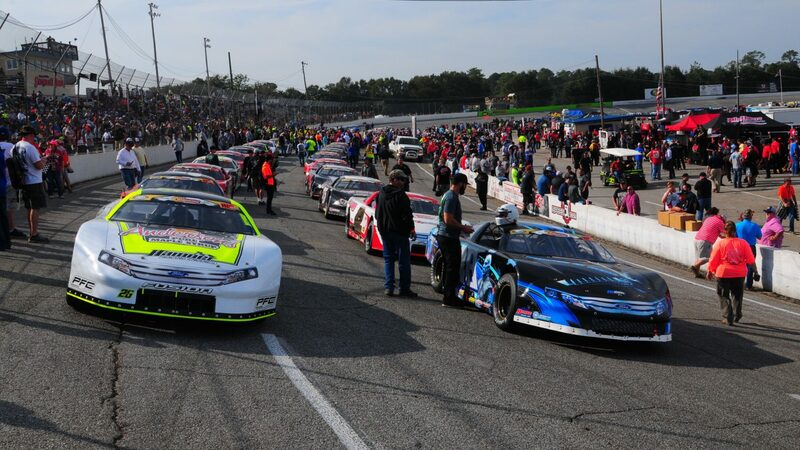 A full day’s drive east on Interstate 40 sat the track now known as Southern National Motorsports Park in Kenly, N.C., home of that day’s season finale of the American Speed Association ACDelco Challenge Series. ASA changed its cars from straight Late Models a few years earlier, so the two extended-distance shows weren’t drawing completely from the same pool of racers. But there were a few star drivers who probably could have found rides in either event. Another potential conflict was with television channel TNN; the network which was once a major player in motorsports broadcasting aired the North Carolina Sweet Potato 400 live and showed the All-American 400 a week later. The two 400s were won by two of those series’ most accomplished drivers. Freddie Query made this All-American his first of two straight victories at the Tennessee State Fairgrounds’ signature race. Query, then sponsored by Plemons Insurance and the RaceCar College (which evolved into RaceCar Engineering) didn’t run a full schedule in 1997. The next season he teamed up with sponsor Greased Lightning and won nine times en route to a dominant All Pro championship campaign. This 400 was Query’s only win of 1997 in the tour which later became NASCAR Southeast and ended after 2006. Query led more than 270 laps on the day, but it took a green-white-checkered finish for him to find the lead at the end. One time zone to the east came the crowning achievement of Kevin Cywinski’s first ASA championship. The native of Mosinee, Wis., had the title clinched before his Scott LaFavre-owned team arrived at Southern National, and this was his fourth win of the year. Cywinski took some time away from ASA in 1998-89, driving for Bob Brevak’s team in the then-NASCAR Craftsman Truck Series, and rejoined LaFavre Racing in 2000. From that point on he ran every ASA race until the series folded after the 2004 year; he won the final two titles in the series which added “National Tour” to its official name near the end. His last recorded start was in 2007, ironically in the inaugural race for the ASA (now ARCA) Midwest Tour. Both Cywinski, age 53, and Query, at 66, are active in the sport in street clothes and wearing headsets. After hanging up his helmet Cywinski went right into team ownership in the ARCA Racing Series presented by Menards. Win-Tron Racing has guided a number of drivers to their first ARCA victories, including James Buescher, Blake Bjorklund, Justin Marks, Matt Merrell and Brandon McReynolds. It’s still a single-car operation based in Mooresville, N.C., in an era where mega-teams are often out front. Gus Dean is the Win-Tron driver this year, and he scored a victory at, ironically, Elko. The 2007 season was also the last in which Query tasted competition. Most of his racing near the end of his driving career came at Concord Speedway, a few miles from his home. When Concord’s Big 10 restarted for a few years, Query once again took center stage, as he did in the Big 10’s first iteration in the early 1990s. Query continues imparting his knowledge on the younger generation. In recent years he has guided Dan Leeck to a Jegs CRA All-Stars Tour title and Kyle Benjamin and Harrison Burton to multiple Florida Speedweeks victories, served as crew chief at Snowball Derbies for Dan Fredrickson and 2010 winner Johanna Long, and headed annual winter seminars at Advanced Racing Suspension. His 2018 attention was most often focused on Northwest legend Garrett Evans and his son Jan, and he’ll be with Garrett at this year’s Snowball Derby December 1-2 at Five Flags Speedway in Pensacola, Fla.
For current photos of Query and Cywinski, please see the LMD Facebook page. We hope you have enjoyed this piece of Late Model history. Contact us for more information on Late Model Digest!